Thirsty Pilgrim: Experimenting With Cacao. 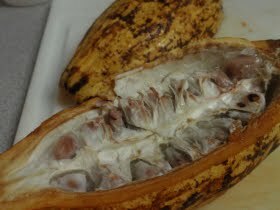 What you see in the photo is the inside of a cacao fruit. To me it's a bit gross, like something from H.R. Giger. But it smells nice enough. Here in Costa Rica you can buy this fruit in the supermarket, or local farmer's market, or pick them from the trees if you know where to look. Possibly you can find them in fancy big-city markets in the States or Europe these days, I'm not sure. I do know this: Through one of our favorite processes — fermentation — those seeds can become cocoa nibs. And those can be used to make chocolate. Or drinks that include chocolate. Including beer. That's pretty much our project in this case. We plan to mature our own cocoa nibs to make chocolate, or steep them in a home-brewed stout — let's call it dry-nibbing. 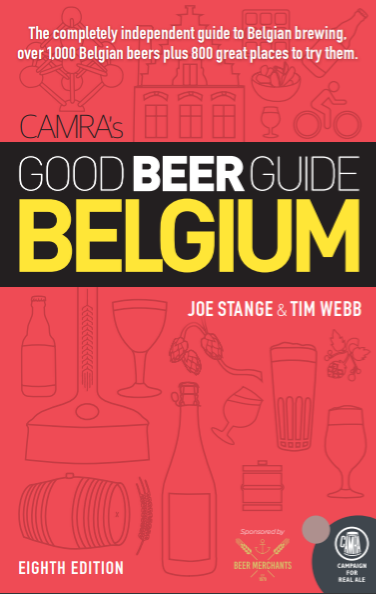 Unfortunately it's not very clear how to conduct that fermentation process in your own home. There are plenty of sites like this one that advertise cocoa nibs — already fermented — which you can buy and use to make chocolate "from scratch." Except it's not really from scratch. A lot of the hard work was already done in the jungle. Basically, farmers put the cacao seeds — sweet-smelling, fruity pulp and all — into wooden crates lined with banana leaves and leave them there for as long as a week. There may be some stirring involved. Meanwhile there are unseen, natural critters at work, transforming the seeds from something that tastes like potatoes (trust me on that one) into something that vaguely resembles dark, bitter chocolate. Somehow — call it homebrewer's intuition — I think that the wooden crates and banana leaves are not exactly necessary. Unfortunately I can't seem to find a lot of information on this, and we're left with the opportunity to experiment on our own. Which is not all bad. Our first attempt resulted in sweet-smelling nibs that still tasted like potatoes. But there are more attempts to come. Anyway: After we've done a bit more research, and toying around, look for a post titled "How to Ferment Cocoa Nibs at Home, and How Much to Drop Into Your Stout." Or something like that. Cool idea, I bet if you put them in the mash before the boil you'd be able to use the enzymes from the malt to convert the starches in the cocoa to sugar and if that doesn't work i think you can buy enzyme at the homebrew store or online. I suspect if you add them at any point during or after the boil it will just make beer taste starchy. Hmmm, makes me wonder what kind of microbes or fungi they use to ferment the cocoa though. Sounds like a cool project! I'm just looking around the net I see a good site.. here's the link http://cacaosupreme.com they are making the chocolate cacao. for the general information of every one the eating of chocolate is part of balanced diet and exercise program that can imporve quality and perhaps the quantity of life.. they have the studies to peove that..
Also on their Cacao Creeme an Instant Ice creeme just simply add supreme ice creeme powder wih water, blend with water and it's ready to go a Home Made Ice Creeme, But it's soon to be released can't wait for it..